Reading is one of my favourite things to do anyway, but adding some festivity to it gets me even more into the Christmas spirit. On the cold winter nights, getting snuggled up with a hot chocolate and a thick blanket reading a good book is honestly what I live for. Every year I always try read Christmas themed books and I’ve been gathering a little collection of them. All the ones I’ve read I’ve loved and I wanted to share with you guys as these Christmas book aren’t too popular (well some of themmmm) and I feel like they really do need love as they’re incredible. The first book I’m going to talk about is ‘my true love gave to me’ this is a collection of 12 short stories that count down to Christmas. They are all written by different authors. Personally I loved this as it was a new short story everyday and they were all so good, with a Christmas. Another Christmas book I love is dash & lilys 12 days of Christmas. This is a follow on (I think??) to a previous book about dash and lily but just with a Christmas themed! It’s perfect happy Christmas read for anytime who wants a teenage love story really. A classic I really enjoy is a Christmas carol. I read this for the first time last year as I’m studying it for GCSE. Admittedly it did take some enjoyment out of the book but none the less it’s a classic story everyone knows and loves! Finally, this isn’t specifically a reading book, but it’s Christmas based! It’s Tanya Burr’s book, Tanya’s Christmas! I loved this as It’s full of Christmassy things like recipes, stories and DIY’s that get you right in the festive mood. Last year I was so excited reading it and I can’t wait to get it back out next year Christmas is such a cosy time so when better to read?? 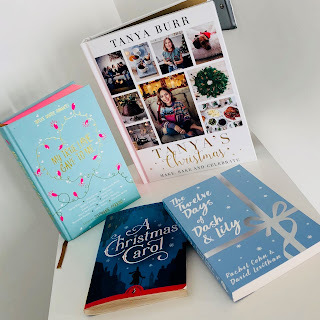 Taking in the festivity in books is so exciting as it’s as if you can imagine yourself there in the book which is one of my favourite things to do, especially since dash & Lily’s 12 days of Christmas is based in New York! A Christmas Carol is indeed such a timeless and quality classic! I also love to read that book around this time of year. My parents collected lots of Christmas books, some that stand alone or are a collection of lots of little classics. They're mainly for children, but that doesn't stop me from picking one up from the basket by the fireplace & having a little read through on a cosy December evening! I've been wanting to read some Christmas-y books before bed! Gonna check out the short story collection you mentioned. Seems like a nice treat to read one every night before the big day!